Stay on top of your leads, schedule sales calls & followups, integrate your workers IMAP email accounts, & automatically match emails to the appropriate customer. Reminder types: flag that show on the Overview, emails reminder, and/or Google calendar items. Link a task with a new lead so that the next time that lead is viewed, you are reminded. Combine with our Workers module and schedule your workers sales and other tasks. Use permissions to customize your workers experience with the task manager. Filter your task list to make sure you are doing the tasks important to you. For tasks without due dates, simply enter them so you can work on them when you have time. Makes sure you are staying in contact and poised to make another sale. New CRM tab on leads shows your communication with that customer sorted by last touch. Communication log shows IO emails sent, Task Manager tasks, IMAP emails, phone records, and Journal entries. Adds capability to add journal entries, which are notes with date and time stamps. 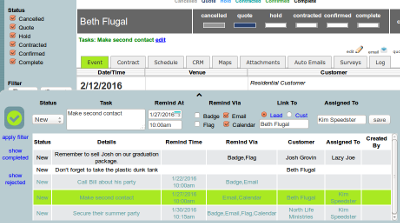 See last contact and last customer action date and time stamps that can be used in custom reporting as well. Tracks recent customer interactions with your company via phone, email, and website visits. Phone calls add to the score of how hot a lead is. Clicks of links in emails are automatically tracked regardless of where the link points, and hot lead score is updated. Code that you add to your website tracks customer interaction with your website inside your InflatableOffice account. New filters allow you to find and sort leads based on how interested the customer is. InflatableOffice downloads and matches your emails with leads and customers. IMAP emails are shown in the communication log timeline and are easily viewed without leaving IO. Choose whether to share your customer emails with other workers at your company or not. Looking for event rental software?